Yar, har, fiddle-dee-dee, being a pirate is alright with me! Do what you want 'cause a pirate is free, you are a pirate! "Also, check the curtain in Pirate Cove from time to time. The character in there seems unique in that he becomes more active if the cameras remain off for long periods of time. I guess he doesn't like being watched. I don't know..."
Unlike the other animatronics in the game, Foxy will hide for a while before coming to attack the night guard, depending on how much he is watched or not watched. It is currently unknown as to why he is the only animatronic who has this behavior. Foxy's also got one of the best jump-scares in the game without being a real jump scare: rather than just jumping out at you in the control room, you'll see this jerk running down the hallway on the security camera, charging in to murder you proper. Whereas most of the FNAF animatronics function like Weeping Angels, never moving while watched, Foxy bucks the trend by suddenly appearing in a mad dash to freak you out good and proper. 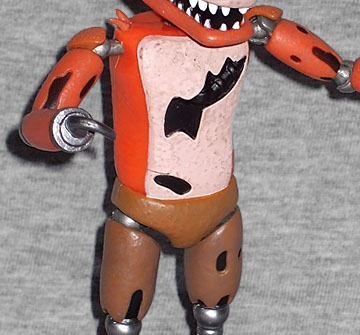 It helps that Foxy's design is so tattered, which is captured very well in this action figure by Funko as part of the Five Nights at Freddy's line. 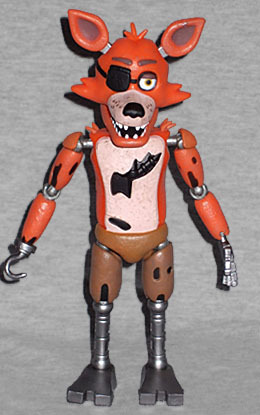 Unlike the much more complete coverings of the other animatronics, Foxy has big slashes in his fur, as well as having numerous servos and mechanical parts fully revealed, including his legs, his lower leg and both hands, one of which has been replaced with the aforementioned pirate hook, going nicely with his eyepatch. Because the sculpt is fairly soft and not quite up to the level of NECA-detail, the rips in the fur mostly reveal only black underneath, but the effect is still quite striking. Foxy is arguably the best looking of these Funko offerings. Foxy is also nicely complimented with a suitable paint job, which gives some nice detail to parts of the sculpt like the snout and the exposed metal appendages. The fur, though limited in color, still looks effective thanks to the bumpy sculpt; it all works together nicely. Alas the articulation, while plentiful, still presents the same problems as the other Funko FNAF figures. While Foxy sports all the same points of articulation, including balljoints at the shoulders, elbows, legs, knees and so on, these are still prone to falling away with any movement, and the much-missed articulated jaw is still absent. This is particularly frustrating with Foxy, who's so well-known for screaming at the player while charging into the control room, sadly stuck with a slightly-opened mouth forever and ever. And, unfortunately, Foxy has nothing accessory-wise but his piece of the series' Build-a-Figure Spring Trap, the torso. Still, as far as these figures go Foxy is quite a good addition to the line, and one of the standout figures. 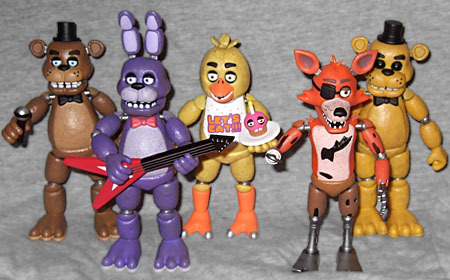 With the others, Foxy looks terrific, and he's very iconic to this popular game series. One might have wanted a little more detail on this figure but the price seems right - with the exception of that jaw issue, I cannot complain. If you don't mind that particular omission, consider Foxy a must-own!